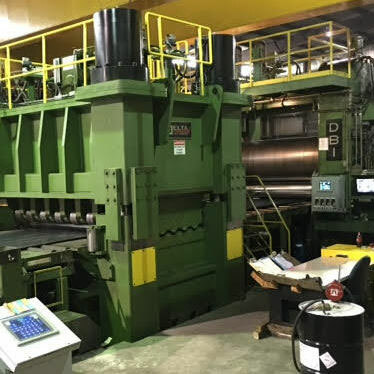 Delta Steel Technologies, Irving, Texas, has upgraded the temper mill cut-to-length line at State Steel Supply Company in Sioux City, Iowa. The line is now capable of processing steel up to 1″ (25mm) in thickness and up to 96″ (2500mm) in width. Delta was contracted on a “turn-key” basis to design, manufacture and install the equipment within a very limited time period. Delta and State Steel are proud to announce that the equipment is fully operational. Delta supplied a new plate leveler, new rotary shear and complete new control system.